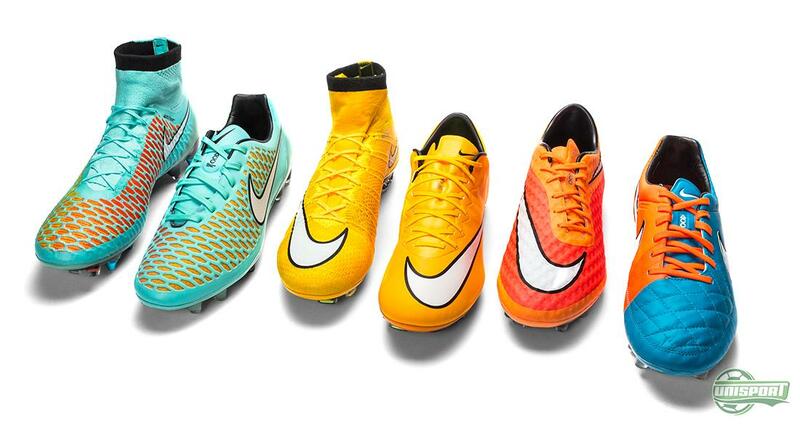 Nike with updates for all their boots: colours are back! It’s been about two months since we last saw a colourway update on Nike’s four silos. Nike may have gone back to the basics with their Black Pack, but that must have meant they were saving the colours for this new range of boots. The colours have flown freely in Nike’s design department and the result can be seen here, with the newest colourway updates from Nike. Nike’s last colourway update was introduced the day after the World Cup final and was a fresh start to a new period in the football calendar year. This collection was designed entirely in black and was therefore aptly named the Black Pack. While the Black Pack signalled the end of the World Cup, then you could say this new collection kick-starts the Champions League that began last night. You can pre-order the new colours right here. The colours are back with a bang, with the main theme building on a strongly visualising and eye-catching concept, which Nike have been strongly inspired by through the last few years. The result is six very colour-happy football boots, which include the Mercurial Super and Vapor, Magista Obra and Opus, Hypervenom and last, but certainly not least Tiempo Legend. 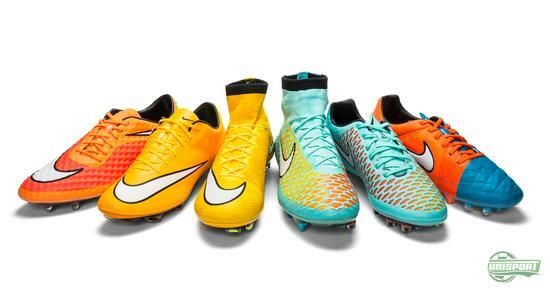 The Mercurial Collection has actually cheated a little. 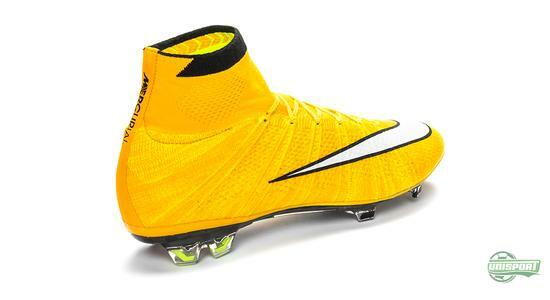 It is no more than a month ago that Nike launched the Electric Green colourway for the Superfly and Vapor, which was presented as a Cristiano Ronaldo exclusive. This will however not keep Nike from releasing this new model, which this time round comes with an orange coat of paint. Find the new colours for the Mercurial Superfly and Vapor right here. The colourway update is the fourth that has come the way of the two models and will naturally be used on both the Mercurial Superfly and Vapor. It therefore doesn’t matter if you’re name is Hazard or Alexis Sanchez, there will be a boot for you. Apart from the new colourway, these two superstars also have another thing in common, they are all ambassadors of explosive speed. 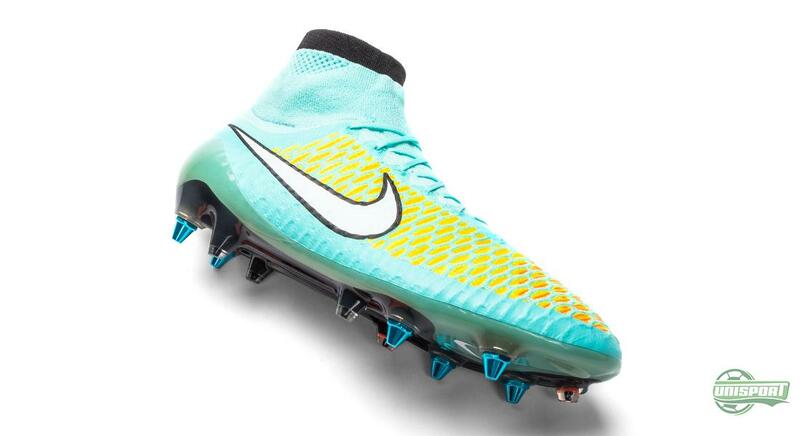 So it doesn’t matter if you are a fan of the innovative Superfly, or the familiar Vapor, you are ensured a boot geared for speed and visual bombardment. 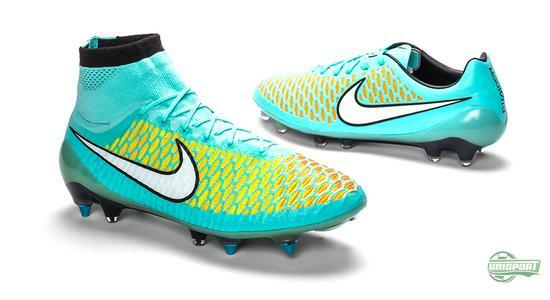 The Magista-collection is another boot that didn’t play by the rules. With the last colourway update this boot was unveiled in two version and this model is therefore also the fourth update of the new boot. 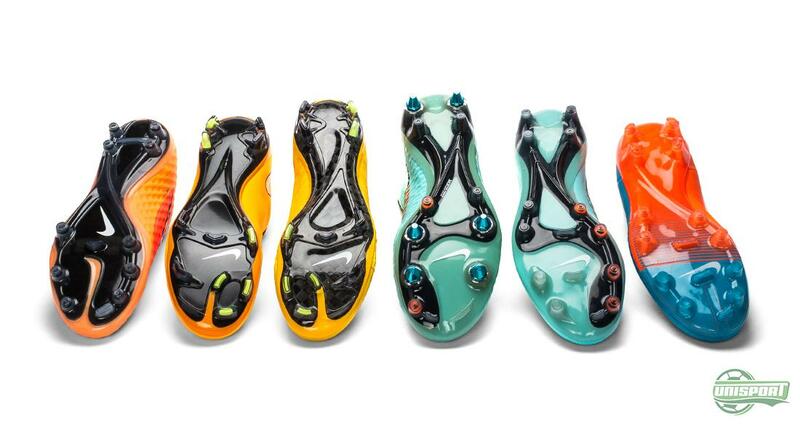 And while the World Cup-model is still remembered for its match-winner during the final, the boot has moved to a turquoise nuance, supported by yellow and orange. Nike thereby continue to deliver their sharp and slightly off the grid designs for the Magista, which the eyes might need a second to adjust to. Get the new colours of the Magista Obra and Opus right here. 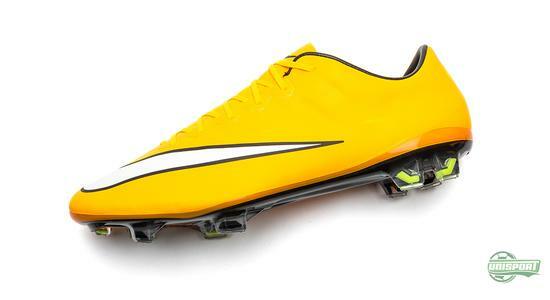 Just like with the Superfly and Vapor, the Obra and Opus are presented in the same colour-combination. This collection first and foremost stands for and represents control and vision, which is helped along the the 3D structure on the upper. The fit of the two boots is the area, where the two boots differentiate the most. The Obra is made of the Flyknit material and with the Dynamic Fit Collar, while the Opus is without Dynamic Fit Collar and with an upper of synthetic KangaLite, which some may remember from the CTR360-collection. 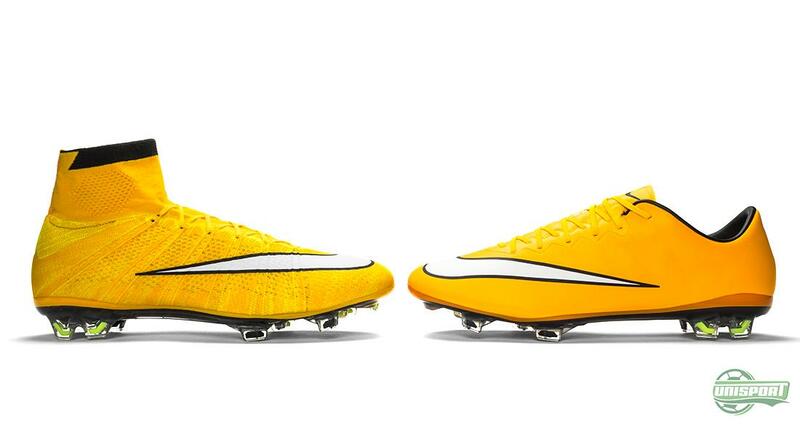 The Hypervenom has already seen quite a number of colourways, but Nike don’t look like they are running out of cool colourways to showcase. This new combination is a prime example of that. At first glance you might think it resembles the Hyper Punch model, which was used during the World Cup, but if you go closer you will come to realise that the new colours really don’t look or feel like the older brother. 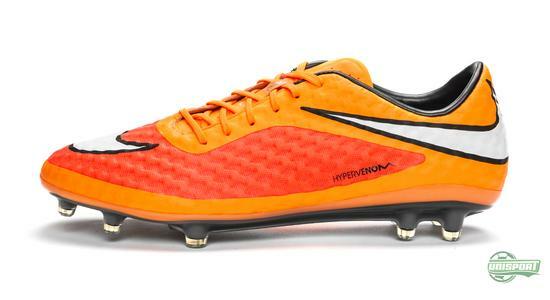 Get the new colours for the Hypervenom here. The Tiempo has since 1994 been synonymous with elegance and the perfect touch. 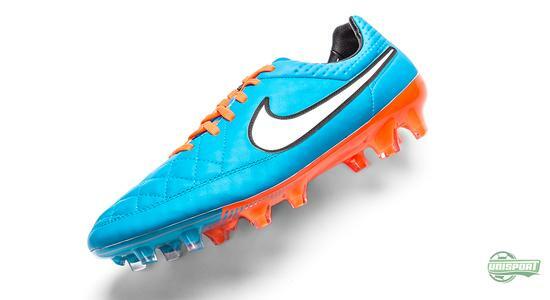 This has been underlined especially by Ronaldinho and Pirlo, who have been championing the Tiempo for many years. Today the Tiempo is the weapon of choice for many of the Worlds very best defenders, with Piqué, Sergio Ramos and Ron Vlaar. 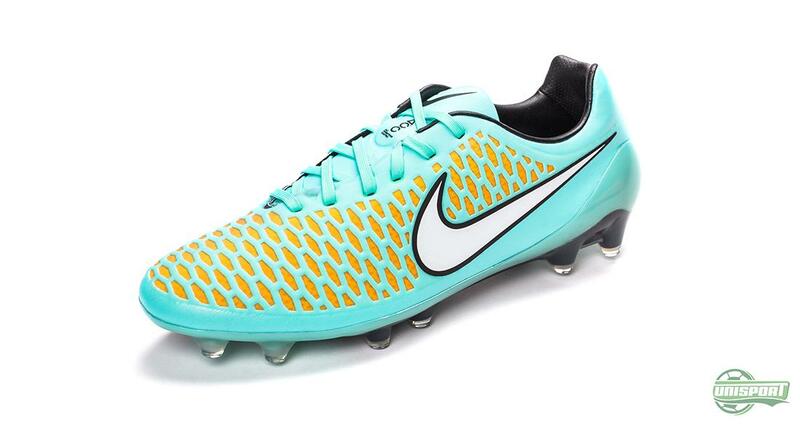 Find the newest from the Tiempo-collection here. Once again there’s fresh new boots up for grabs from Nike and this time colours are far from at a premium. 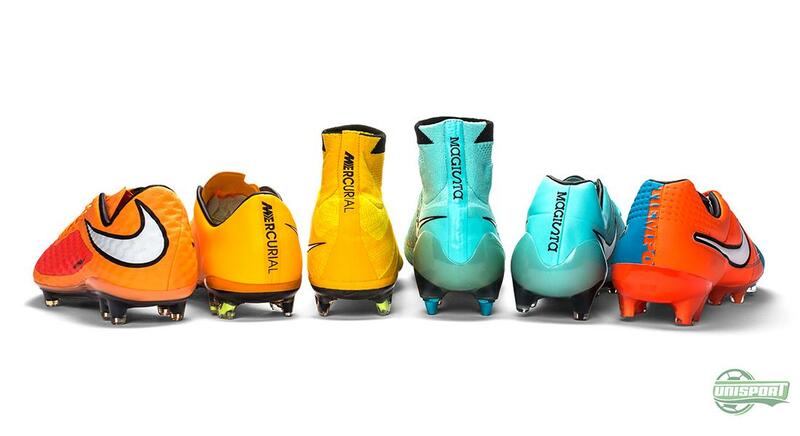 The new collection has something for everybody, but which of the six boots is your favourite?